A new haul video is just up on my channel where I shared my drugstore brand hauling. 1. HUDA BEAUTY LIQUID MATTE LIPSTICK IN SHADE GOSSIP GURL. Buy from here: NYKAA website. 2. MAYBELLINE MASTER CHROME HIGHLIGHTER IN SHADE MOLTEN GOLD. 3. 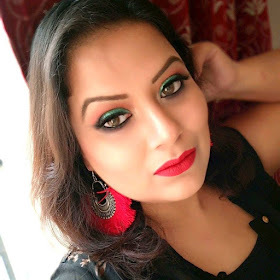 MAYBELLINE SUPERSTAY MATTE INK IN SHADES LOVER AND CREATOR. 7. MAYBELLINE GIGI HADID LIPSTICK IN SHADE AUSTYN. 8. PAC RETRO MATTE GLOSS IN SHADE 40. 9. PAC BAKED HIGHLIGHTER IN SHADE 03. 10. MAKEUP REVOLUTION CONCEALERS IN SHADE C6 AND C8. Buy from here: Hokmakeup website. 11. SUGAR COSMETICS STICK FOUNDATION IN SHADE 01 LATTE. Buy from here: Sugar cosmetics website. 12. SUGAR COSMETICS MATTE EYELINER. 16. INGLOT GEL EYELINER IN SHADE BLACK. 17. WET N WILD EYESHADOW PALETTE "ROSE IN THE AIR". 18. NYKAA UNICORN NAIL PAINTS IN SHADE SUGAR N SPICE AND PINK PONY. 19. NYX HIGHLIGHT AND CONTOUR PALETTE.